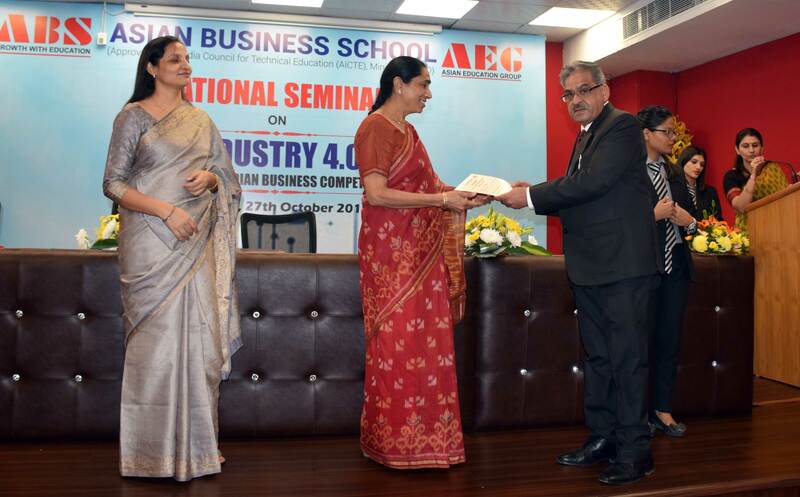 On Saturday, the 27th October 2018 National Seminar on “Industry 4.0: A Roadmap for Indian Business Competitiveness” was organized by Research & Development Cell at Asian Business School, Noida. The seminar was an initiative in the direction of bringing together industry, academia, and researchers for sharing insights about the next revolution in industrialization -Industry 4.0. There were a total of 50 research papers that were received for the seminar of which 30 research papers were presented. There were two tracks in the technical session one each for students and academicians/ industry persons. The technical session stated post lunch from 2:00 pm and continued to 4:00 pm of the day. The chairperson of the technical session for the academicians/ industry persons was Dr. Anupama Vohra, Associate Professor-Faculty of Management Studies, the University of Delhi with Mr. Nikhil, Assistant Professor- Asian Business School as the co-chair for the session. There were a total of 14 papers presented in this technical track of academia and industry person. The other track of technical session was run parallel for the students. The chairperson for this track was Dr. Supriya Srivastava, HOD- Asian Business School with Ms. Monika Dixit Bajpai, HOD- Asian School of Business as the co-chair for this session. A total of 16 papers were presented in this technical session for the students. The presentations were judged for the best paper award (for both categories) on various parameters like relevance to the context, methodology, appropriateness of findings, the impact of presentation, etc. Both the technical session had a diversified outlook of various presenters giving more insight into the latest industrial revolution -Industry 4.0. This helped to build awareness and understanding of Industry 4.0 and know the status of the Indian ecosystem and related gap, challenges, and future opportunities for Industry 4.0.